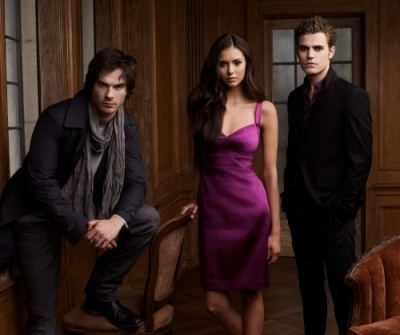 damon-elena-stefan. . Wallpaper and background images in the the vampire diaries tv show club tagged: the vampire diaries damon stefan salvatore elena ian nina paul. This the vampire diaries tv show photo might contain gaun koktail, selubung, cocktail gaun, berpakaian orang, jas, celana jas, celana panjang, orang berpakaian, perapi celana, hip boot, and thigh boot.